We have seen a lot of Hand Foot Mouth cases this summer. If you would like to know more about it, click here. 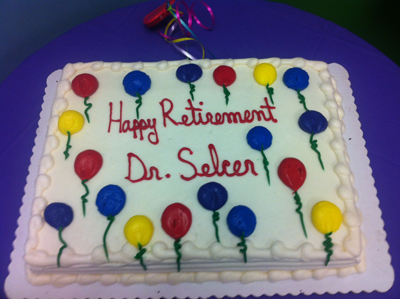 After 31 years of service, Dr. Donald Selcer bid the practice goodbye. We are honored to have had him as a colleague and wish him well as he enters the newest chapter of his life. Thank you to our staff, old and new, our patients, our colleagues, our family, and our friends for all of your warm wishes and happy memories. Click here to see more photos of his heartwarming retirement celebration. Although Dr. Selcer will be greatly missed, we are so happy to welcome Dr. Lisa Turman to the Castro Valley Pediatrics family. Click here to learn more about Dr. Turman. The flu vaccine is recommended for all patients six months and older. Please call to make an appointment. As a reminder, these appointments are immunization only and you will not be seeing a doctor. If your child needs to see a doctor, please make an ill visit appointment. If you have any questions regarding the flu vaccine, please call and speak with your doctor. The Centers for Disease Control this year is not recommending nasal spray flu vaccine for children. Therefore, this year we will be only offering injectable flu vaccine. We apologize for the inconvenience. It is kindergarten enrollment season. Please call to make your child's health check appointment. Bring their yellow card or immunization record and all school health forms to the appointment. It's time for fun in the great outdoors. Summer is also a great time to check out local organic California produce at your farmer's markets and enjoy summer favorites such as melons, berries, corn, tomatoes, and sweet peas! Remember to keep yourself and your kids sun safe. Click here for important sun healthy tips for infants and children. Water safety is also a must this summer. Consider swim lessons for your children ages 5 years and up if they don't already know how to swim. Keep supervision one on one for infants and toddlers around pools (even kiddie ones! ), hot tubs, beaches, and lakes. Make sure all passengers on recreational watercraft are wearing life jackets. We also have new videos up about Whooping Cough and Measles in our Patient Education section. Check them out! Heavy Televisions can be a safety hazard. Please click here for important information about anchoring your televisions safely. There is a nationwide recall of Infants TYLENOL Oral Suspension, 1 oz. Grape due to dosing system complaints. Please go to http://www.tylenol.com for more information. We hope 2012 finds you and your family healthy. With a New Year comes new laws. California Law now requires children to stay in booster seats until they hit 8 years old or 4 feet, 9 inches tall. Please check to see that you have a proper booster seat for your children. It's that time of year again! We will be asking you to fill out a 2012 registration form the next time you come into our office. You can do this ahead of time by printing the registration forms from this website and filling them out before your next visit. Please also make sure we have a copy of any new insurance cards. Our Ramp is Now Ready for Use! We are happy to announce that the stroller/wheelchair access ramp to our office is now in full use for your convenience! Need Medi-Cal Medical Insurance? Apply Online now! Click on Health-e-App to apply online. Have Medi-Cal and Need a Dentist? Search for a dentist online! Click on Denti-Cal or call 1-800-322-6384 for help finding a dentist. Wishing you and yours an abundance of health, love, and gratitude this Thanksgiving. If your child needs to be seen over the holiday weekend, we are open in the mornings on both Friday and Saturday. We are thankful for all of you and your continued support! Enjoy and be safe. Check out these Halloween Safety Tips. Also think about your school or your dentist's candy buy-back program tomorrow if you find you have an abundance of candy you don't know what to do with. We have been busy ushering our patients into a healthy school year by getting our teens and pre-teens up to date with their whooping cough vaccine. We are also giving everyone over the age of 6 months their annual flu vaccine. If you haven't already, call our office and make an appointment for your child's annual check-up and get up to date! National Kids to Parks Day is Saturday, May 21, 2011!!!! Join the fun with kids across America. Sign up at www.BuddyBison.org and get great resources for outdoor, healthy living. For the 2011-12 school year, a new law now requires that all incoming 7 th -12 th graders get a whooping cough booster shot, called Tdap, before entering school. This shot is routinely recommended for children ages 10 and older. Flu Vaccine Season is Here! All patients over the age of 6 months should receive a flu vaccine this year. We have injectable vaccine for children ages 6 months to 23 months, and either injectable or flumist for patients 24 months and older. Please call our office to make an appointment for this season's flu vaccine. Please click on the following web link for more information about the recall of Children's Tylenol, Motrin, Benadryl, and Zyrtec products. We still have injectable H1N1 vaccine and can offer it to all of our patients. We no longer have any form of seasonal flu vaccine or H1N1 mist. If your child still has not received their H1N1 vaccine or needs to schedule their second H1N1 vaccine dose, please feel free to call for an appointment. We still have H1N1 vaccine in mist and injectable form and are able to offer it to all of our patients. If your child still has not received their H1N1 vaccine or needs to schedule their second H1N1 vaccine dose, please feel free to call for an appointment. We did not receive or administer any of the recalled lots of H1N1 vaccine. Our practice did not receive or administer the recalled lots of H1N1 0.25 ml vaccines. We are awaiting notification from Sanofi Pasteur whether we distributed the recalled H1N1 0.25 ml vaccine for children ages 6 months to 3 years. There is no safety issue, the issue is vaccine strength or potency. We will let you know if your child will need another booster once we are informed from the company. We currently do not have the recalled vaccine in our office. We have a limited number of injectable Seasonal Flu vaccine. We will not be getting further shipments of Seasonal Flu vaccine. If your child still needs the Seasonal Flu vaccine, please call for an appointment. We have plenty of H1N1 nasal mist and injectable (0.5 ml and 0.25 ml doses) vaccine available. If your child needs their first or booster dose of H1N1 vaccine, please call our office for an appointment. We have received additional H1N1 mist and injectable vaccine. If your child is over the age of 2 years and needs to make an appointment for H1N1 vaccine, you may do so now. See announcements below for how we are prioritizing mist and injectable H1N1 vaccines. We are still waiting for the preservative-free 0.25 ml injectable dose of H1N1 vaccine for our patients who are 6 months to 2 years of age. The Federal Government has waived the ban on preservatives in vaccines for children under the age of 3 years for the H1N1 vaccine only. If your child is 6 month to 2 years old, or 2 to 3 years old and immunocompromised , you have the option of receiving the 0.25 ml dose with preservative. We also have useful information about this flu season in our Patient Education section. Our last flu vaccine clinic is this Saturday, November 21, 2009. Thereafter we will only have a limited supply of H1N1 mist vaccine. Although we are expecting another shipment of injectable and intranasal H1N1 vaccine, the supplier will not tell us when it will arrive. Therefore, we are unable to schedule the second dose of H1N1 vaccine at this time. We will post another announcement once we have more vaccine available. Although we had ordered seasonal flu vaccine in the summer, our supplier has informed us that we will not be receiving the remainder of our order for the seasonal flu vaccine. We apologize for any inconvenience to you. We are attempting to vaccinate as many patients as possible with at least the first dose of both vaccines, but are subject to the limitations of supply. We recommend H1N1 and seasonal flu mist vaccine for all healthy children 2 years and older. The mist is well-tolerated, preservative-free, and appears to give better protection against influenza than the shot. You cannot receive 2 mists in one day, so to be protected from H1N1 and the seasonal flu, the 2 mists must be separated by at least 14 days. The H1N1 and seasonal flu 0.5 ml shot is indicated for children 3 years and older who are immunocompromised, for example on oral prednisone or chemotherapy. Your doctor will tell you if your child requires the shot. The 0.5 ml shot contains a small amount of thimerosal (mercury) preservative. The H1N1 and seasonal 0.25 ml dose is indicated for children 6 months to 2 years old who are too young to receive the mist, and for children ages 2-3 years old who are immunocompromised and cannot receive the mist. The 0.25 ml shot is preservative-free. TWO (2) doses of H1N1 vaccine (either mist or shot) are recommended for ALL CHILDREN 9 YEARS AND YOUNGER. The 2 doses should be at least 21 days apart. TWO (2) doses of seasonal flu vaccine are recommended for all children for whom this is their FIRST YEAR of receiving seasonal flu vaccine. The 2 doses should be at least 21 days apart. If you have to choose which vaccine to receive first, we recommend getting the H1N1 first. H1N1 is much more prevalent in our community at this time. We expect seasonal influenza to peak in January or February. Please ask your doctor if you have further questions about H1N1 or seasonal flu vaccine. CDC Podcast "Take 3 Actions to Fight Flu"
Please call to make your appointment now. Please specify whether you are getting intranasal or the injectable flu vaccine. If your insurance does not cover your requested vaccine we can still administer it for a cash fee. These appointments are for flu vaccine only. If your child is ill or you have questions regarding the vaccines, please schedule an appointment to see your doctor during regular business hours. We wish you a healthy winter season!